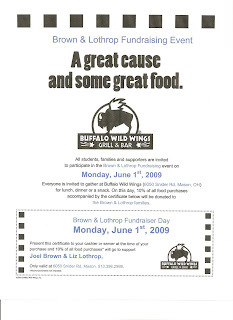 Hey everyone we will be having a FUNdraiser for Elizabeth and Joel on June 1st. Their teacher, Melissa Grablovic, and Lizzy's home school teacher, who has put in countless hours with her, is now graciously putting this event together. Thanks Melis! This will also be a great way to celebrate the end of end the school year and the beginning of summer. It will be an awesome way to see everyone who has been praying, sending cards, calling, and reading Lizzy's blog. Attached is the flyer. Bdub's said everyone must have theirs and we are not allowed to hand them out. I will have extra with me so if you forget yours just find me and I will give you one. We are checking with Bdub's to see if tee-shirts can be sold and split the pot can be done. We will also have some more Joel and Liz bracelets on hand to sell for $3 if anyone would like one and did not get one before. Can you tell I am excited about this event!!!!!!!!! Abuelo's was so much fun to see all of our friends in one place and we can't wait to do it again. Liz is doing well as far as her numbers go, unfortunately she feels pretty crummy most of the time. She has been on pain killers which helps with her body pain. She does not sleep well due to the steroid she is on so this makes her a bit emotional.....grumpy and tired. We are heading down to the hospital today. Orange Tuesday, for another round of chemo, Vincristine and Daunorubicin; they are pretty tough chemo's and she feels pretty puny with them. Liz will probably sleep a lot today. God has given me such beautiful children to love and care for. Through this I see even more of Elizabeth's strengths and solid faith in Jesus. I am in awe of her and wonder how I would handle something like this if it were happening to me. I hope I have learned how to deal with adversity like Elizabeth has; with quiet strength and determination. Looking forward to Bdub's! Hope Liz gets some good rest today. Congrats on another week closer to the end of treatment! Can't wait for Bdub's!! Is there any way i can get one of Leah's bracelets? I really would like one to go with my Liz and Joel bracelet. Hey love! oh my goodnes! i miss you so so so so much! i havent seen you in such a long time! if you feel up too it id absolutely love to visit you! just text my and ill be there! at school we still have our liz days for you every tuesday! so many people have layups for liz shirts and we all wear them on the same day for you:)!!! our school is having a fundraiser for jessica elam soon. idk if you remember her but she has a brain tumer and has been battling cancer since fourth grade. but anyways the fundraiser is a dodgeball tournament. i was thinking maybe that would be a good idea for a fundraiser for you! there are tons of people at school participating in it and they are earning a lot of money for her. I want you to know that your blog has helped me tremendously in dealing with my own sister's battle with cancer. She passed away last Monday after a year long battle with esophageal cancer. We likened her tenacity and courage to that of a platoon of Marines. Last Saturday my daughter Madeline Kroell walked in the relay for life at Sycamore, under the name "Syc no Moe". Liz's name appeared on their shirts along with my sister Peggy's name. Their team was the top fundraisers for the whole event. I am so proud of her! I got a chance to tell Peggy about the event and it brought a smile to her face. Just know that Liz has a special angel in heaven cheering her on. You are an incredible family...and such an inspiration to me. We love you lizzie and miss you very much!